Can’t wait until Labor Day to get away? Or, do you want to beat the Labor Day traffic and plan a last minute beach getaway? Whether you need something for the weekend or for Labor Day, Southern Vacation Rentals has exactly what you’re looking for. How does 20% off your vacation sound? If you check out by August 31, you can save 20% on ANY vacation home or condo! This is the perfect opportunity to book that Destin vacation home or condo you’ve been dreaming about. For the tennis lover, check out Tops’l Beach and Racquet Resort – Summit 311. This two bedroom, two bathroom vacation condo in ultra-popular Miramar Beach sleeps eight guests. Enjoy world-class accommodations at Tops’l Beach and Racquet Resort, including fully-equipped kitchens and a stunning view. The resort’s amenities don’t disappoint, featuring on-site dining, indoor and outdoor pools, and more. Or, send summer off in style in a luxury vacation home. Sandcastle Dreams is one of our favorites – this seven bedroom, six bathroom home can sleep 20! 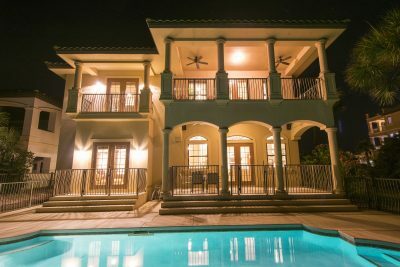 Enjoy luxury living just steps away from the Gulf of Mexico in the highly sought-out Crystal Beach neighborhood. Plus, private patios with views of the tranquil lake? Don’t mind if we do. For your Labor Day getaway, why not Pearl by the Sea in Miramar Beach? Six bedrooms and four bathrooms can easily accommodate 16 guests. It’s perfect for a family vacation under the sun! Or, why not A Sun of a Beach, also located in Miramar Beach? If a family vacation is what you have in mind, this one is perfect as it sleeps 10 guests. Enjoy access to Beach Retreat Cottages’ community amenities as well as nearby beach access! Visit Southern’s specials page to view all current deals!